Since your ministry will never run out lf guys and girls, we're helping you out with more small group curriculum designed to tackle issues relevant to each gender--from each gender's point of view. 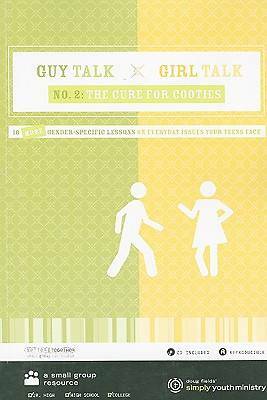 In Guy Talk Girl Talk 2: The Cure For Cooties, you'll get ten weeks of ready-to -use-yet fully customizabble--lessons, handouts, promotional materials and more. And while the material is written twice for separate guys and girls groups, the topics are the same for each lesson (like, you'll both study "Temptation" at the same time), just one is geared for guys and the other geared for girls. This not only saves you tons of time in prep, but it also gives you lots of opportunity for discussion in a mixed group later. The teaching and discussion-based nature of the curriculum is designed for students to not only learn more about what the Bible has to say about these topics, but also for students to grow closer and accountable to one another. These are great topics for guys and girls to discuss while away on a retreat. If you'd like to have almost three months of biblically-based material for your students, this is it. Your students may never look at each other the same way again (praise God! ).